We knew it was coming but I don’t think anyone would have imagined it happening so quickly. The end to the veteran teams is here, whether you like it or not. We have already seen the San Antonio Spurs and Los Angeles Lakers crash out of the playoffs in the first two rounds. Of the remaining teams there are two true veteran sides left, the Dallas Mavericks and Boston Celtics and they are doing everything they can to prolong their stay at the top of the NBA food chain. But there will come a time where the younger sides catch up and overtake them, it may have already happened. The part after that is the most frightening because you don’t know when your team will have a legitimate chance to compete for a championship again. It is evident that the Spurs – Lakers era has come to an end (that is if the Lakers don’t get Dwight Howard) Tim Duncan and Kobe Bryant cannot put up the numbers they used to when they carried their teams. It’s sad and depressing to think that sooner rather than later we will see our favorite players taking a back seat to younger talent. As their numbers decline, playing time gets reduced and if they chose not to retire we will be able to find them in another uniform sitting on the end of the bench like Shaquille O’Neal. But there is a light to this, with all these old guys stepping aside there will be room for new and upcoming talent to fill that void and for current stars to win some silverware that may be the only thing missing from their trophy collection. Yes that’s directed specifically to LeBron, but I would love to Dwight and Kevin Durant to win the MVP and a championship during the next ten years while they are still in their primes. There are very bright days ahead for the NBA, I wish I could say the same for the veteran teams mentioned as it is win now or possibly lose your chance for a long time. If we have learned anything from these playoffs it is that no team is safe. 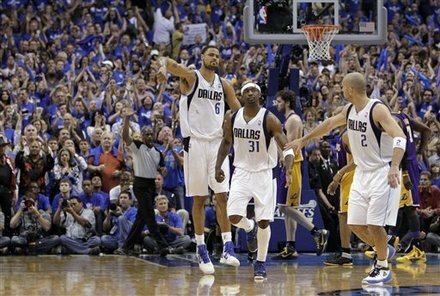 The Los Angeles Lakers are yet another “favorite” on the brink of elimination down 3-0 to the Dallas Mavericks. I say “favorite” because basically every sports writer outside of Texas has picked them to win. Yes, the Lakers are the two time defending champions, however the Spurs’ resume was also far more impressive than the Grizzlies, and we already know the result of that series. The Mavs also have a reputation, although unlike the Lakers, it isn’t a good one. Soft is the term that we hear the most when people describe the play of Dallas. Their ability to throw away commanding leads, early exits from the playoffs in previous years and most of all the play of the face of their franchise, Dirk Nowitzki, has attributed to this tag. But the Mavericks aren’t who we thought they were, tipped to be the most likely top seed to be upset in the first round, they got through the Trail Blazers pretty convincingly and weren’t given a chance against the defending champs. Softness is no longer a factor, they have been grinding it out all playoffs. Games 1 and 3 against LA could have gone either way, it could easily be 2-1 in favor of the Lakers but the Mavs were the ones making plays, limiting mistakes down the stretch and most of all the outstanding play by Dirk. Now that they are up 3-0 there is still no time to relax, they haven’t actually won the series yet and it would be a shame to be known as the first team in NBA history to drop a three game lead in the playoffs. 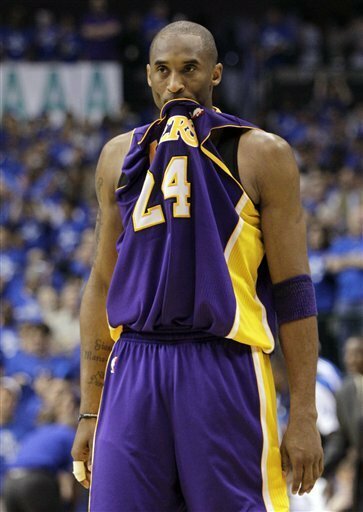 Lakers guard Kobe Bryant told the media yesterday that he is confident that they will still win this series. It is highly doubtful but Kobe will more than likely try to take over every game that follows in an effort of desperation to stay in these playoffs and win his sixth ring. If he does achieve this then he could possibly have an argument of being as good as MJ, However Michael never let his team go down 0-3 in a series. I find it hard to believe that the Lakers won’t win a single game this series, but the way the Mavs have been playing a sweep is on the cards. Do you have thoughts on this topic? Reply in the comments section. Follow us on twitter @hoopsweblog and subscribe to get regular updates. 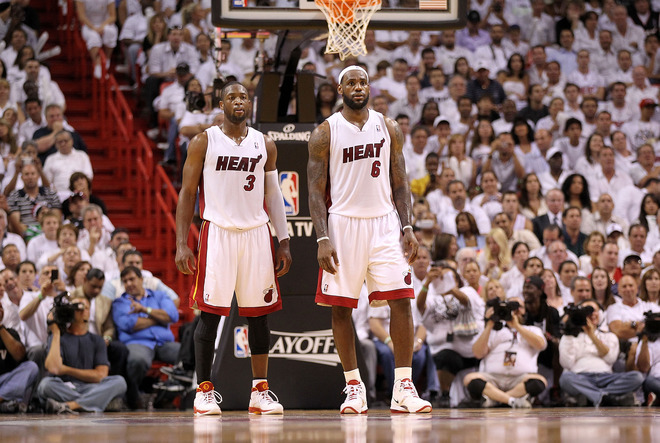 “Not 1, not 2, not 3, not…” You get the picture, these were the words spoken by LeBron James about how many championships the Heat would win at Miami’s celebration of their new superstar and Chris Bosh. Since then the Heat have had their ups and downs, there has been a lot of questions about how long it will take them to get going and start playing as a unit. There is no “I” in “team,” it is evident that one single star player cannot win a championship, see 2007 NBA Finals Cleveland Cavaliers and 2001 NBA Finals Philadelphia 76ers as prime examples. However there are two “I’s” in “championship” and Miami have used this equation to make what could possibly be a championship team. This formula is starting to become the latest craze in the NBA, in the next two years we will be seeing more superstars teaming up with a monster free agent class coming up in 2012. Therefore the statement made by LeBron above could become very difficult to achieve if my math is correct. However with their recent playoff run the Heat have gotten the hang of the two superstar and Chris Bosh system. Taking care of the 76ers in five games and now punishing the veteran Celtics, who I had picked to win in six games. They say it isn’t a series until one team wins on the road but I don’t think home court will assist the Celtics against this Heat team. Nevertheless Miami has established itself as one of the hot teams in the playoffs (no pun intended) with the Dallas Mavericks in that same conversation. Based on what I have seen thus far the Heat look like a very promising prospect for the title this year if their two superstars can stay productive and Bosh to play like a big. Just to address the fact that this post isn’t to hate on Bosh if you have noticed, he is a key piece in Miami’s team however I don’t rate him as a superstar. I will dedicate a post to him some time in the future. In the present I am picking the Heat and the “tough” Mavs as favorites to make the finals, yes a repeat of the 2006 Finals, minus Shaq and pretty much everyone else. Although I wouldn’t mind being proven wrong. Do you have thoughts on this topic? Reply in the comments section. Follow us on twitter @hoopsweblog. Subscribe to get regular updates about what’s happening in the basketball world.